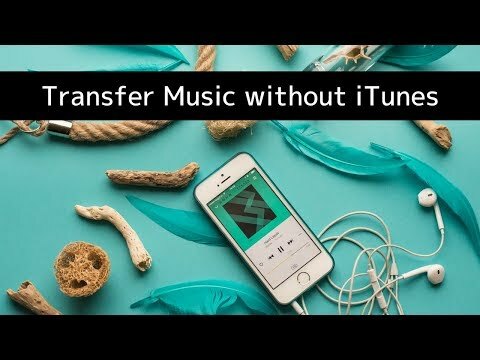 If you have an iOS device - iPhone, iPad, or iPod touch - or an older iPod, such as a classic, nano, or shuffle, you probably use iTunes to sync music to the device. But there may be times when you need to get your music back to your iTunes library. Your computer may have crashed, or gotten stolen, and you may not have a backup. Or somehow you accidentally deleted a song, album, or playlist from your iTunes library, but it's still on your device. In this case, you'll want to get the music from your iOS device back into your iTunes library, but Apple doesn't give you any way to do this. Fortunately, iMazing can help. With iMazing, you can copy music files from your iPhone, iPad, or iPod to iTunes, retaining all their metadata: each track's name, artwork, and even ratings and play counts. And you can also transfer your meticulously curated playlists. And if you're worried about duplicates, well, iMazing makes sure it doesn't copy files already in your iTunes library. Launch iMazing and connect your device to your Mac or PC. Select your device in the sidebar, then select "Music". Select the music you want to export then click Export to iTunes". Click "Next" for the transfer to initiate. 2. Select your device in the iMazing's sidebar, then select "Music". iMazing loads your device's music and playlist(s). 3. Select the music you want to export. If you want to copy your entire library, just click Music in the Library list. If you want to copy a playlist, select it in the Playlists list. Or if you want to copy an album or song, click the Music library and find it in the list, or use the Search field to narrow down your selection. then click Next, and the Music Export Wizard opens. The Music Export Wizard gives you a number of options. You can export your selection by checking My Selection, or you can click Library to export your entire library. If you choose Library, you can then tell iMazing which types of files to save: music, music videos, movies, TV shows, etc. Last Played - this is the date and time of the last time you listened to each track. Click Next, and iMazing starts transferring the files. Depending on how many files you're copying, this may take a while. With macOS 10.14 Mojave, Apple added new security features which guard against malware and spyware accessing your information and controlling your apps via automations. You must now explicitly authorise apps to access specific data and automated actions, and this includes authorising apps sucbh as iMazing to control iTunes in order to import music to your iTunes library.  iMazing ONLY uses these permissions to import media to your iTunes Library. Granting access is perfectly safe! After granting iMazing access through both prompts, you can proceed with the export as usual and will not be prompted again.  You can of course rescind permissions at any time: launch the macOS System Preferences app, select Security & Privacy -> Privacy tab -> Automation and uncheck these boxes to remove iMazing's access to iTunes and System Events. iCloud Music tracks that aren't downloaded cannot be copied, because they are not on your device. If you do want to export music that's in your iCloud Music Library, download it first to your device.